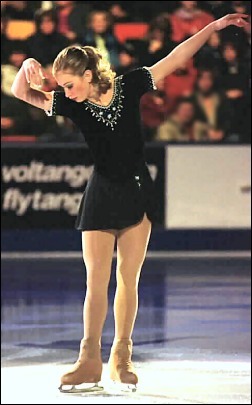 The surprise medalist at the 2002 Canadian Figure Skating Championships was Joannie Rochette. Rochette’s goals for the year were to win a medal at a Junior Grand Prix, finish in the top five at Canadians, and get into the top six at the Junior Worlds. She’s already two-thirds of the way there and can complete the final goal next week in Hamar. In addition, she’s made the senior Canadian international team and will have a chance to compete in the Grand Prix series next season. In the future, she said “I want to be national champion and go to 2006 and 2010 Olympics.” Next year, she’ll be eligible for the Grand Prix series and hopes to do Skate Canada since it will be in Quebec. Joannie said she began skating “when I was 2 years old because my mom took me to the rink.” No one else in her family skates. She began taking lessons from Nathalier Riquier at the Berthierville Skating Club. For the past three years, Rochette has worked with a team of coaches in Trois Rivieres and St-Leonard: Manon Perron, Nathalie Martin, Normand Proft and Danielle Robillard. She trains for about three hours a day five days a week plus another five hours in off ice training. Her off ice training includes “cardiovascular, musculation and stability training,” she said. She has also taken ballet lessons for the last three years. As a serious student, Rochette noted “I don’t have a lot of time for hobbies because I study a lot. I like going to cinema with friends on weekends. I like romantic comedies, thrillers and horror movies.” She also reads, primarily dramatic novels, and listens to music. Among her favorite musicians are U2, Madonna, Janet Jackson and Nine Days. She also emails friend son her computer. She also loves travel, with her favorite trip being to St.Gervais and Mont-Blanc in France. She hopes to visit Hawaii and Asia. For holidays, she likes to go to the beach.